Hi everyone welcome to my blog sharing my DUSTY ATTIC March project with you today and for a change I decided to create a couple of cards Soft Pink and White Easel Card layer upon layer !!! inside view of my card . I hope you are inspired to have a play . happy scrapping and have fun with the chippies . 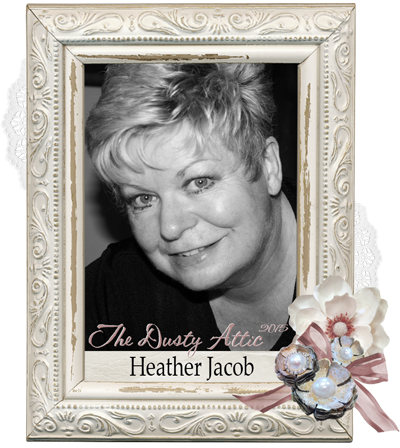 remember the Dusty Attic chipboard can be purchased direct from the website . Gorgeous and so inspirational cards Heather! Your creations are always mind blowing! These are absolutely gorgeous! LOVING the colors and the flowers!!!!!!!!!!!!!! Stunning! Samra said it perfectly! Oh Heather, your creations are a ray of sunshine, so refreshing. I luv your style. Wow wow wow, totally stunning! Beautiful!!!!! Love all those gorgeous layers! Oh your cards inspire me! They are so beautiful and wonderfully layered and always so pretty. Love these Heather.. Roses are always beautiful in your hands, Heather! Gorgeous card! No one does layers better than you, Heather! I just love these cards! The colors are so soft and beautiful. oh my gosh Heather these cards are truly works of art. Just Beautiful! Una composición preciosa. Me encantan los colores. Muy romántico! So very delicate and beautiful...I can imagine putting them in a frame to showcase the gorgeous details and layers.